Philips announced a new line of Hue Outdoor lighting products at CES last year and at CES 2019, Philips is making a few new additions to it. The Philips Hue Outdoor sensor and a few new wall-mounted lights join the existing outdoor lighting range consisting of outdoor bulbs, light strips, and lamps. 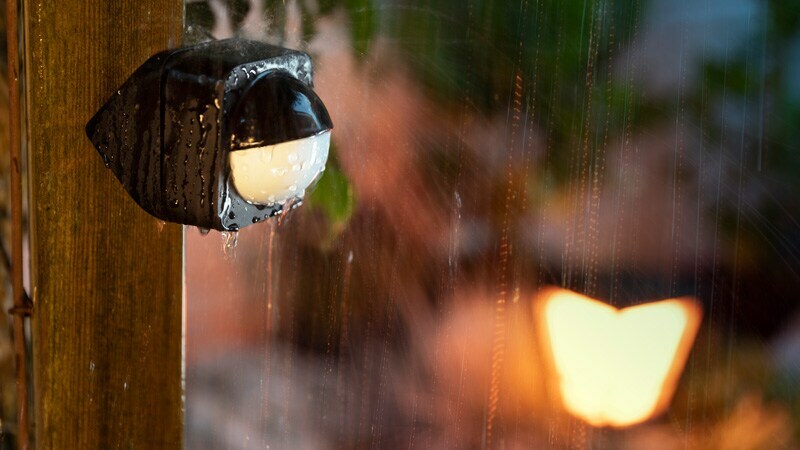 The Hue Outdoor sensor is a weather-resistant, battery-powered, and wireless which means that it can be placed anywhere outside the house without needing a power socket or additional cabling. It has a detection range of 12 metres and when configured via the Hue app can turn on your indoor or outdoor lights automatically when the sensor detects motion. The Hue Outdoor sensor also has a dusk-to-dawn sensor which ensures that the sensor only activates the lights when it's dark. Philips will be charging $49.95 (roughly Rs. 3,500) for this sensor and will start shipping it in February in the US. Other additions to the outdoor lighting range includes the Philips Hue Welcome Flood Light, Discover Flood Light, and Econic family. The Welcome Flood Light has white light only and will retail for $109.99 (roughly Rs. 7,600). The Discover Flood Light has white as well as coloured ambience light, and will retail for $139.99 (roughly Rs. 9,700). While the Econic family starts at $129.99 (roughly Rs. 9,000). All these light fixtures will also start shipping in February in the US. In addition to the new outdoor products, Philips Hue is also gaining new Google Assistant features. By giving voice commands to the Google Assistant, Hue users will be able to activate wake light and sleep effects in the morning and evenings. Users will now be able to set their Hue lights to slowly turn on before the alarm goes off and at night they can set their lights to fade out after a particular time. These Google Assistant features are expected to launch in March.